Shoelace is retargeting on auto-pilot. After on-boarding, you simply sit back and we take care of the rest. We'll contact you once we've created a retargeting strategy for you :) - Pretty cool eh? When you have fully completed on-boarding with Shoelace (going through all the initial set up questions), you'll arrive at a page that shows a progress bar at the top and that Shoelace is "building your audience." This means that we are tracking your store visitors to see if we have a large enough audience to retarget. Our system can take several hours (and up to a day) to create all the necessary back end connections with Facebook and Shopify to allow for ad creation. Once we have data on at least 10,000 visitors to your store, we'll send a journey proposal your way. We send this proposal to you by email and SMS (if provided) or by KIT messaging (if integrated). Generally most of our eligible users receive a campaign within a day of their tracked visitors reaching 10,000. However you can contact support if it has been longer than 24 hours since the tracker hit 10,000 visitors and we will be happy to look into this! Once you receive a proposal, You can edit most aspects of the ad(s) at any time (including before or after setting a campaign live). The type and number of ad(s) you receive will depend on what our system determines will work best for your store and your audience size, as well as your selected plan. 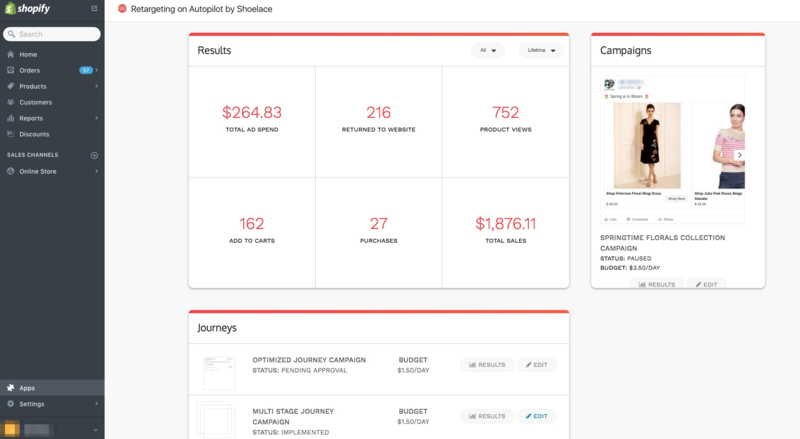 Once you've set a journey live, Shoelace will monitor ad performance and make recommendations to help improve ad performance and alternative or additional ads when appropriate. You will receive these suggestions via SMS or KIT, as well as email (or app messages if SMS or KIT are unavailable). Please check out the rest of our Help Section for general tips as well as more information on some of our integrations!